You might of heard of Maternal bond, Paternal bond i.e. the bonding of mother or father to their child. But have you heard of inclusive bond? Maybe what I witnessed today in a child care centre, a special bonding between the normally-abled teacher and the differently-abled child is an Inclusive bond. Having started thinking about inclusion lately, I went to a school of special kids with 2 other friends to check if the differently-abled kids could perform for India Inclusion Summit 2014. Upon entering the school we were greeted by 2 teachers of the school and were taken to a round table for further discussion. Even we teachers might commit mistakes at times but not our kids. They do exactly what’s taught to them and stick to it. For sure it takes so much time to teach, train the kids in doing various activities, but that does not tire us. We feel very happy watching every step of our kids and get delighted at even on the minute progress they make. Every little movement, dialogue, any scanty progress in a kid, becomes talk of the day for us during our lunch breaks or leisure hours. Be it saying a word or responding to a greeting, showing a gesture, we feel so victorious at every tiny little achievement of our kids. There was so much delight on the teacher’s face while explaining her kid’s achievements, the much needed care that to me it looked as if I was watching a mother share her excitement on her baby’s every little movement since the time it has come into the world. I have heard, seen many mothers, fathers share their babies pictures, stories, videos of every little act as they grow so enthusiastically.However to me the enthusiasm of the teacher explaining about her special kids so ardently was no less to joy of any other mothers or fathers. May be this bonding between a normally abled teacher and a differently-abled kid is what is the sacred inclusive bond. I am sure it is this inclusive bond that has kept this amazing teacher bonded with her special kids intact from the last 14 years . Without such inclusive bond it might not be possible for any to be so kind, generous, humble, and patient, persevere fighting the odds with such fighters. On the other hand today, it was also disheartening for me to hear about teachers, therapists getting lured with higher pays and snatched away from the real needy. This is a worrisome situation in our society to be thought upon and acted. Though the inclusive bond might not be so fragile, it is always subject to damage when luring factors such as money, perks peek in. Won’t it be disheartening to see a mother or father leave their baby? In the same manner is it not throbbing to see the sacred inclusive bond damage and let a teacher or therapists desert the much needed kid? Now, if we could wake up, support, spread awareness on inclusion then I am sure together we can secure and safeguard the inclusive bond. As I reach the end of this post, I get a mail confirming a Yakshagana performance of the differently-abled at India Inclusion Summit 2014. I am dazzled!! That’s the power of inclusive bond that the teacher portrayed today!! Impossible is possible for those who believe in self, ready to fight the odds and persevere!! Come witness live the inspiring performances at IndiaInclusion Summit 2014. Let us be inclusive, drive inclusion and let the differently-abled to walk their way of success a bit more easily on the vigor of an inclusive bond. I commented saying yes, I have experienced the same quite often and that it’s the magic of our mind. Today, I experience it again! It’s been a week or so since I came across this term “inclusion” through India Inclusion Summit (IIS). Before volunteering for IIS I never knew what inclusion meant and if there was any need for inclusive society.But now after being aware and registering inclusion, inclusive society strongly into my mind, I never miss any chance to watch or make note of any inclusive act wherever it has been executed. · Next, at State Bank Of India (SBI) Mangalore, a label “Counter for Differently Abled” caught my attention. Firstly I was surprised to see the usage of the term “differently abled “in place of stereotyped “disabled”. Secondly, special accessible counters for the differently abled, made me feel very happy for I was witnessing a glimpse of an inclusive society live. · Thereafter, I stumbled on another inclusive act of SBI, constructing ramps and placing wheel chairs in ATM booths for the differently abled in Dimapur. · At a child development centre, where I learnt the differently abled make some souvenirs, I was enthused to see how few corporate respected their work and got few goodies made by them for their conferences, official usage etc even at a dearer price. Isn’t this inclusion? · Today in TV I saw a promo of the show Satyameva Jayate in star plus, where they showed how a city in India Gwalior had become an inclusive, Accessible Gwalior . I felt wow! We are already gearing up towards an Inclusive India. It feels good to see we are inclusive to some extent already. May be lack of awareness is what stops us from creating a full-fledged inclusive society. 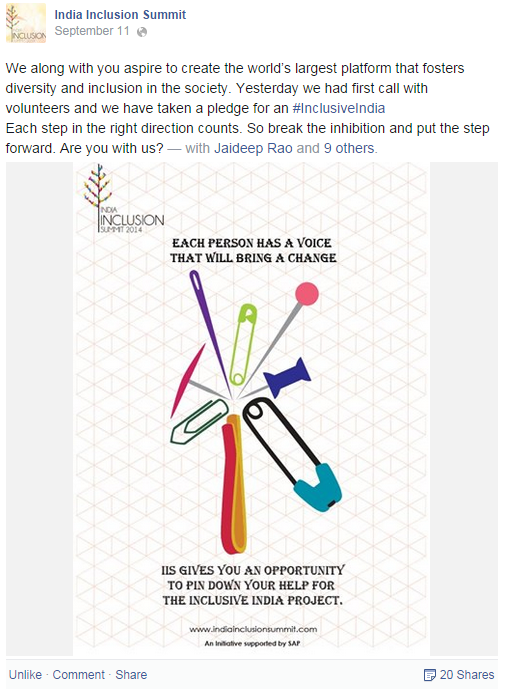 If you have witnessed any act of inclusion or inclusive society do share it with us at indiainclusionsummit@gmail.com. Join us at India Inclusion Summit, support inclusion. Let us share the good will and create an Inclusive India together!! Why Should I or You Volunteer For India Inclusion Summit (IIS) 2014? My urge to volunteer for a thought provoking cause like India Inclusion Summit (IIS) 2014, all started when I started reading the book “GIFTED” gifted to me by a friend. “Gifted” truly touched me with the inspiring stories of people with disabilities. The undying spirits of the differently abled and their way to victory in a road of hurdles kept me in awe. Later when I read couple of posts in Facebook hinting me about upcoming IIS 2014 event, I got even more curious. I felt if I get a chance I must volunteer for IIS 2014 event. ….and I got a chance sooner, registered for the same via a Facebook post by IIS. "poor" intervention for persons with disabilities"
"poor" education and work opportunities. Quickly strike out the"poor" and at least gear the country toward an "average"
2. Every special child must be included in a mainstream society to make our society more tolerant and harmonious. Each one is capable of contributing their bit to the society. 3. Break the cultural, societal silence and inhibition over the issue of inclusion. Most of us live in denial and ignorance. We must come and see these inspirational personalities and realize that they form a resource pool in our society and we have to have an inclusive approach to utilize these resources and reap the maximum benefit for our society. 5. Improve accessibility and assistance to the differently abled to lead a respectful and independent life. Disability might not be a real problem for the differently abled. They know how to strive forward. Rather the main handicap in their lives is “Ignorance and Inclusion”. I volunteer to break my silence and raise my voice for “Inclusion”. Another day dawned beautifully and I got started with my routine a bit more active than any other day; might be because I had plans to visit a school of differently abled kids. Much to my enthusiasm, I finished my household chores quickly and was out on a bike with my husband to the special school. We were greeted by two volunteers at the child development centre. Quickly I introduced myself, my husband and expressed my interest in learning about their activities for the special kids,if they needed any support. To my surprise in a reluctant tone, the 2 volunteers said they have been into this service for about 22 years and have already explored most of the possibilities to help in the growth of the differently abled kids there. They added it is easy to talk about helping, but very difficult to train a mentally retarded kid and do something fruitful. It is not impossible, but very tough. I felt a pinch at that point in time thinking about the special kids. My heart nagged finding them being reluctant in accepting or getting convinced about the possibility in finding some growth opportunity for the mentally retarded kids. The volunteers were kind though and continued detailing us further. Had I visited them before my awareness on inclusion, I would not have felt any sort of pinch and might have even nodded simply to them. However now, after being aware of the magical powers of inclusion and realizing every child has some special gift, my heart budged to ignore or deny any chance of hope for the differently abled. Moving on further I saw a display of souvenirs created with the help of special kids there at the centre. There were beautiful paper bags, paper plates, files, scribbling pads and many more. They were amazing. The volunteers there carry out major tasks like screen printing, designing and involve the kids in all small tasks that are possible by them. It seems they also took bulk orders and supplied paper plates, bags etc for weddings, conferences etc. The revenue of it was used for child development. From the day I started thinking about inclusion, the differently abled kids, their problems etc started surfacing to my eyes or become visible to me. Such thoughts of mine are just few drops in the ocean of inclusive society. Today IIS (India Inclusion Summit) made me think! Tomorrow I make my friends think and next my friends make their dear ones think! So forth if each one of us multiply such drops of inclusive thoughts and support inclusion, then I surely sense a ray of light towards an Inclusive society.